Sometimes a cherished and favorite software disappoints as a result of new update or feature change. Then begins search for alternative software of your favorite software application or program. We get about asking friends, post on forums, social websites to check of different alternative to specific software applications. AlternativeTo website make this process real easy and quick. It lists alternative software for number of popular software. You can browse different software based on operating platform among Linux, Windows and Mac. It also lists alternatives for popular online web tool and services. Website interface is very neat and alternative software listing is impressive. 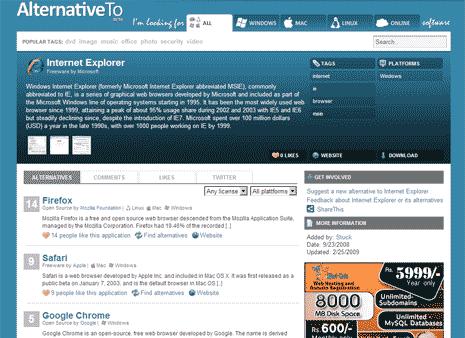 Above image show alternatives to Internet Explorer web browser – that was easy! Even for difficult and rare alternative software searching, AlternativeTo is impressive and resourceful! The idea is simple and brilliant. I like it. This is very useful for me pal, because I don’t have any budget on buying softwares or purchasing license. So, I used to surf the net for free alternatives. Another good thing that I’ve noticed on their site is they enable us to choose on which OS we would like to search. They even support searching for online alternatives. Very cool feature.